Background: Patient navigators play a critical role in working across interdisciplinary cancer teams and guiding patient care throughout the cancer continuum. Training for cancer patient navigators is needed to increase navigator capacity to improve health outcomes, especially given the current climate of provider shortages and high healthcare costs. Objective: The objective of the study was to evaluate the efficacy of the competency-based online Oncology Patient Navigator Training: The Fundamentals, designed by The George Washington University Cancer Center to increase confidence among participants in training learning objectives, which align with patient navigator competencies. Methods: We analyzed pre- and postlesson data from 671 learners who completed the training from 2015 to 2017 to assess changes in confidence across learning objectives. Questions were asked on a 5-point Likert scale (strongly disagree to strongly agree). We calculated summary statistics and compared pre- and postlesson scores using paired t tests. Results: Learners reported statistically significant (P <.001) improvements in confidence across all objectives, increasing from an average mean of 3.6 to 4.3. Learners who completed this training also reported high intention to implement new strategies/skills/information into practice (87.7%). Discussion: The Oncology Patient Navigator Training: The Fundamentals was found to be efficacious in improving participant confidence, and learners intended to apply their training in practice. Further research on how effectively the training prepares participants for certification and for ability to perform navigation duties in practice is warranted. Conclusion: This fundamental training for patient navigators increased learners’ confidence on competency-based learning objectives. As cancer navigators become more integrated into the health system, competency-based training for navigators is needed to reduce variation in practice, clarify team expectations of the role, and sustain the profession.3,22 The Institute for Patient-Centered Initiatives and Health Equity at The George Washington University (GW) Cancer Center (formerly known as GW Cancer Institute) was at the forefront of efforts to establish consensus-based core competencies for cancer patient navigators.23 More recently, the GW Cancer Center collaborated with the Academy of Oncology Nurse & Patient Navigators (AONN+) to develop a certification process to further advance and standardize the profession of cancer patient navigation by offering a competency-based exam for nonclinically licensed generalists. This article will discuss the learning outcomes of a training developed by the GW Cancer Center based on the core competencies for nonclinically licensed patient navigators. The objective of this study was to evaluate the efficacy of the Oncology Patient Navigator Training in delivering satisfactory content to the intended audience as well as increasing learner confidence in the learning objectives and intent to practice what they learned. The GW Cancer Center developed the Oncology Patient Navigator Training: The Fundamentals (henceforth referred to as the Patient Navigator Training), a no-cost, self-paced online training designed to train patient navigators on the core competencies of their practice; basics of healthcare; basics of patient navigation; basics of communication; professionalism; and enhancing practice (Table 1). The training includes 21 lessons organized into 7 modules and totals 20 hours of learning content. The training includes interactive knowledge checkpoints, and videos, including scenarios demonstrating concepts discussed and case studies. The training modules are locked, so participants must complete lessons in sequence. The GW Cancer Center does not impose any prerequisites or criteria that participants have to meet to take the training—it is open to anyone to enroll. The training intends to increase learners’ confidence in the core competencies for patient navigators and provide solid preparation for the AONN+ Oncology Patient Navigator–Certified Generalist (OPN-CG) certification exam. The training also offers 12 continuing education credits to Certified Health Education Specialists (CHES) and Master CHES at no cost. Since the training launched on May 7, 2015, to March 31, 2017, 675 learners completed the training, with hundreds more in progress. The training evaluation framework was informed by the Kirkpatrick Evaluation Model, which is commonly used to evaluate trainings, including those for healthcare professionals.24,25 Since the training is online and self-paced, evaluation focused on the first 2 levels of the model (Level 1: Learner satisfaction, and Level 2: Learning outcomes). The sample for this evaluation included learners (N = 671) residing in US states, tribes, and territories who voluntarily enrolled and completed the training between May 7, 2015, and March 31, 2017. Learners who practiced outside of US states, tribes, and territories were excluded from the sample (n = 4). Demographic data, such as age, gender identity, race, ethnicity, and state, were collected beginning January 13, 2016. All earlier learners for whom demographic and geographic data were missing were kept in the sample and could include international learners; however, this number is expected to be low. Before and after each lesson of the training (except for the training overview: Module 1), learners are required to rate their confidence in their abilities pertaining to the lesson’s learning objectives. 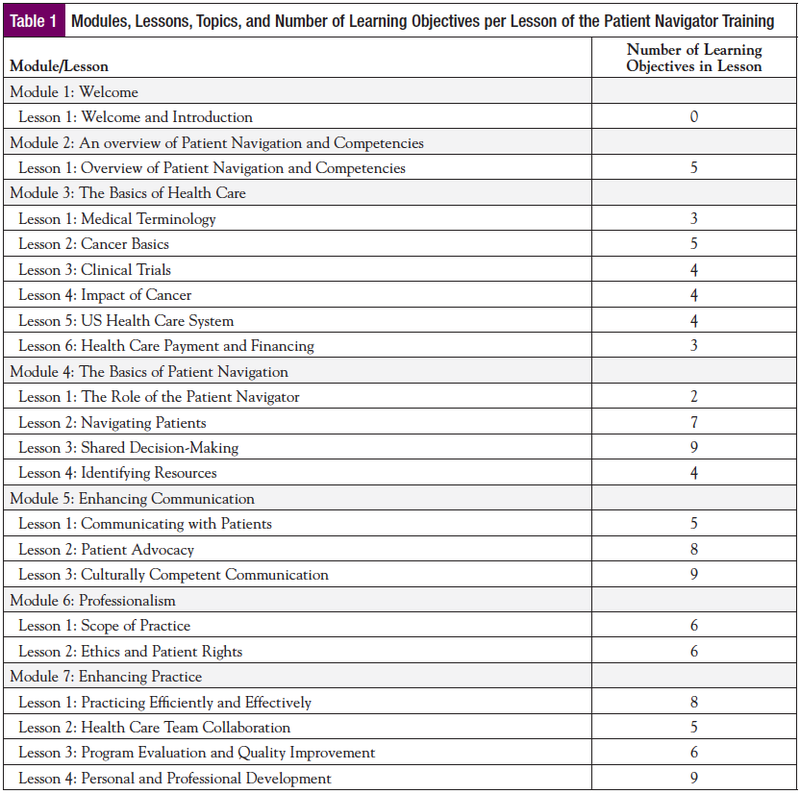 Lesson learning objectives correspond to patient navigation core competencies. Learners are only allowed to complete each pre- and postassessment once. The number of learning objectives assessed varies by lesson based on the content covered, ranging from 2 to 9 (Table 1). For example, questions that assess changes in confidence for Module 2, Lesson 1 are: “I am confident in describing the Core Competencies for Patient Navigators,” “I am confident in my ability to define patient navigation,” “I am confident in my ability to describe social determinants of health and health disparities,” “I am confident in my ability to discuss the history and evolution of patient navigation,” and “I am confident in my ability to explain models of patient navigation.” Participants are asked to rate each statement on a 5-point Likert scale from 1 (strongly disagree) to 5 (strongly agree). Each lesson also has a postevaluation questionnaire assessing self-reported knowledge, strategies and skills gained, and intention to implement them, also measured on a 5-point Likert scale (strongly disagree to strongly agree). This study did not meet the definition of human subjects research per guidance from the Institutional Review Board at the GW. We used STATA/IC 14.2 for all analyses. Univariate frequencies and descriptive statistics were obtained for all demographic, learning assessment, and process monitoring items. We used paired t tests to compare pre- and postassessment means for both individual learning objectives and for grand means for each lesson. Completion of lessons was associated with statistically significant changes (P <.001) in learners’ perceived confidence for every learning objective item from pre- to postassessment (results not shown for brevity). 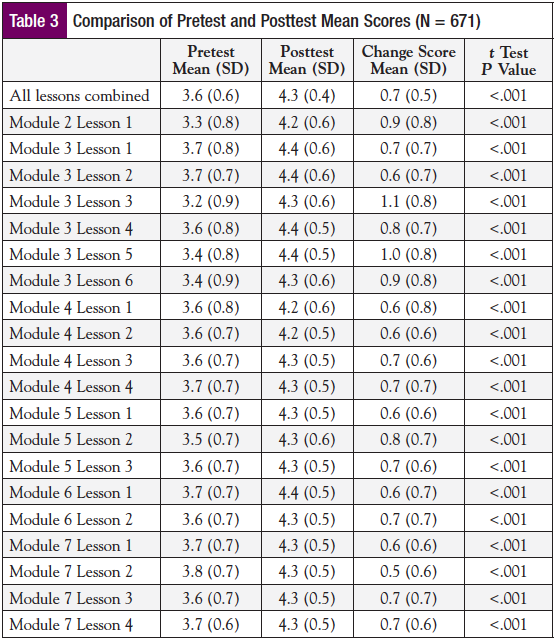 Across all training preassessments, confidence in learning objectives averaged 3.6 (SD 0.6), whereas across all postassessments, confidence averaged 4.3 (SD 0.4) (Table 3). These increases in learner confidence from pre- to post­assessments were statistically significant overall and by lesson (P <.001). On average across all lessons, most participants strongly agreed or agreed the training enhanced their knowledge (93.4%), they gained strategies/skills/information (90.7%), and they intended to implement new strategies/skills/information (87.7%). Process outcomes also indicate positive results. A majority of participants strongly agreed or agreed the training provided them with the skills and resources needed to successfully navigate patients (91.9%), and it was useful to their professional development (94.2%). Further, nearly all participants strongly agreed or agreed content was clear and effective (94.4%), and the training used good, practical examples to teach/illustrate major points (94.5%). More than half of learners (58.2%) strongly disagreed or disagreed that they needed more information before implementing new strategies/skills/information as a patient navigator. The training reached a broad geographic audience, likely because the training was online and available at no cost. Despite being developed for patient navigators who are not clinicians, the training still attracted nurses, social workers, and other clinician learners, possibly filling a gap in practical continuing education for reducing barriers to care across the cancer continuum. The vast majority of learners were female, non-Hispanic, and white. These demographics may reflect limitations of existing reach or the need for greater diversity within the navigation profession. Going forward, the GW Cancer Center plans to partner with community-based organizations that represent more diverse navigators and add closed captioning to expand reach to hearing-impaired learners. Limitations of this study include selection bias and response bias. This study only assessed the outcomes of participants who completed all lessons in the training, who are likely motivated learners. Additionally, the self-reported nature of the assessment is susceptible to response bias. The assessment uses a 5-point Likert scale, which does not qualitatively detail reasons for self-reported ratings. Future directions for research could include qualitative research that would provide details on reasons for self-reported ratings and assessing impact of the training on longer-term outcomes, such as how effectively the training prepares participants for certification, navigation practice, and improved patient-reported outcomes. As the demand on cancer care systems increases, patient navigators will continue to play a critical role in providing access to quality, timely, and culturally competent care, especially for historically underserved populations. This study demonstrates that the Patient Navigator Training delivers content to a wide audience and increases self-reported confidence across all learning objectives. Patient Navigator Training can be found by visiting http://cancercenter.gwu.edu/for-health-professionals/training-education. We applied the sequence-determines-credit approach for the sequence of authors. We are grateful to Rhea Suarez for her contribution of exporting and cleaning data for analysis. This work was supported by Cooperative Agreement #5U38DP004972 from the Centers for Disease Control and Prevention. Its contents are solely the responsibility of the authors and do not necessarily represent the official views of the Centers for Disease Control and Prevention. Oncology Patient Navigator Training: The Fundamentals was created in response to an identified need to increase expertise in patient navigation and help national comprehensive cancer control programs build capacity and implement evidence-based public health strategies. Freeman HP, Rodriguez RL. History and principles of patient navigation. Cancer. 2011;117(15 suppl):3539-3542. Crane-Okada R. Evaluation and outcome measures in patient navigation. Semin Oncol Nurs. 2013;29:128-140. Wells KJ, Valverde P, Ustjanauskas AE, et al. What are patient navigators doing, for whom, and where? A national survey evaluating the types of services provided by patient navigators. Patient Educ Couns. 2018; 101:285-294. 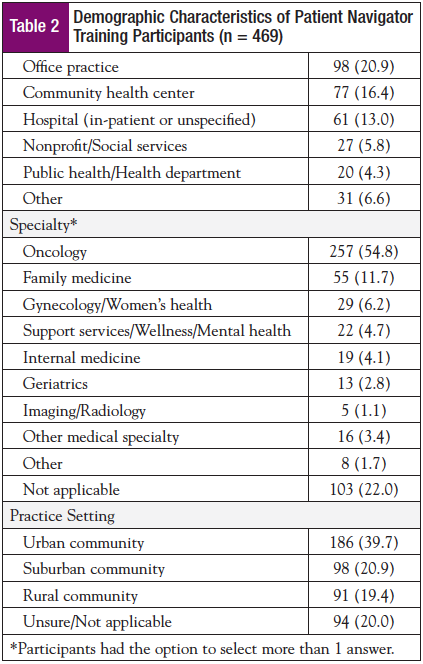 Johnson F. Systematic review of oncology nurse practitioner navigation metrics. Clin J Oncol Nurs. 2015;19:308-313. Willis A, Reed E, Pratt-Chapman M, et al. Development of a framework for patient navigation: delineating roles across navigator types. Journal of Oncology Navigation & Survivorship. 2013;4(6):20-26. Jean-Pierre P, Cheng Y, Wells KJ, et al. Satisfaction with cancer care among underserved racial-ethnic minorities and lower-income patients receiving patient navigation. Cancer. 2016;122:1060-1067. Clark JA, Parker VA, Battaglia TA, Freund KM. Patterns of task and network actions performed by navigators to facilitate cancer care. Health Care Manage Rev. 2014;39:90-101. Natale-Pereira A, Enard KR, Nevarez L, Jones LA. The role of patient navigators in eliminating health disparities. Cancer. 2011;117(15 suppl):3543-3552. Allison AL, Ishihara-Wong DD, Domingo JB, et al. Helping cancer patients across the care continuum: the navigation program at The Queen’s Medical Center. Hawaii J Med Public Health. 2013;72:116-121. Ell K, Vourlekis B, Xie B, et al. Cancer treatment adherence among low-income women with breast or gynecologic cancer: a randomized controlled trial of patient navigation. Cancer. 2009;115:4606-4615. 11. Gabitova G, Burke NJ. Improving healthcare empowerment through breast cancer patient navigation: a mixed methods evaluation in a safety- net setting. BMC Health Serv Res. 2014;14:407. Gunn CM, Clark JA, Battaglia TA, et al. An assessment of patient navigator activities in breast cancer patient navigation programs using a nine-principle framework. Health Serv Res. 2014;49:1555-1577. Hendren S, Chin N, Fisher S, et al. Patients’ barriers to receipt of cancer care, and factors associated with needing more assistance from a patient navigator. J Natl Med Assoc. 2011;103:701-710. Whop LJ, Valery PC, Beesley VL, et al. Navigating the cancer journey: a review of patient navigator programs for indigenous cancer patients. Asia Pac J Clin Oncol. 2012;8:e89-e96. Battaglia TA, Bak SM, Heeren T, et al. Boston Patient Navigation Research Program: the impact of navigation on time to diagnostic resolution after abnormal cancer screening. Cancer Epidemiol Biomarkers Prev. 2012;21:1645-1654. Campbell C, Craig J, Eggert J, Bailey-Dorton C. Implementing and measuring the impact of patient navigation at a comprehensive community cancer center. Oncol Nurs Forum. 2010;37:61-68. Dudley DJ, Drake J, Quinlan J, et al. Beneficial effects of a combined navigator/promotora approach for Hispanic women diagnosed with breast abnormalities. Cancer Epidemiol Biomarkers Prev. 2012;21:1639-1644. Percac-Lima S, Cronin PR, Ryan DP, et al. Patient navigation based on predictive modeling decreases no-show rates in cancer care. Cancer. 2015;121:1662-1670. Percac-Lima S, López L, Ashburner JM, et al. The longitudinal impact of patient navigation on equity in colorectal cancer screening in a large primary care network. Cancer. 2014;120:2025-2031. Psooy BJ, Schreuer D, Borgaonkar J, Caines JS. Patient navigation: improving timeliness in the diagnosis of breast abnormalities. Can Assoc Radiol J. 2004;55:145-150. Rocque GB, Pisu M, Jackson BE, et al. Resource use and Medicare costs during lay navigation for geriatric patients with cancer. JAMA Oncol. 2017;3:817-825. Ustjanauskas AE, Bredice M, Nuhaily S, et al. Training in patient navigation: a review of the research literature. Health Promot Pract. 2015;17:373-381. Pratt-Chapman ML, Willis LA, Masselink L. Core competencies for oncology patient navigators. Journal of Oncology Navigation & Survivorship. 2015;6(2):16-21. Curran VR, Fleet L. A review of evaluation outcomes of web-based continuing medical education. Med Educ. 2005;39:561-567. Militello LK, Gance-Cleveland B, Aldrich H, Kamal R. A methodological quality synthesis of systematic reviews on computer-mediated continuing education for healthcare providers. Worldviews Evid Based Nurs. 2014;11:177-186. US Department of Health & Human Services. Regional Offices. www.hhs.gov/about/agencies/regional-offices/index.html. Updated January 28, 2015. Accessed June 18, 2018.